Herring fishing along the East coast of England was a thriving industry. Never more so than after World War Two which curtailed most fishing activities and allowed the Herring to flourish and multiply in massive numbers. 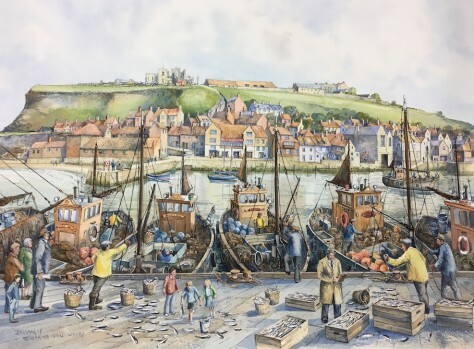 Whitby in the post-war 1950`s saw the harbour filled with fishing boats as they followed the Herring shoals down the coast. This study depicts more of the boats, some local, many Scottish, unloading their catch. What it does not show are the stacks of boxes and barrels used to transport the Herring by road and rail all over England. Signed Giclee`Print. Image size approx 20" x 15" Excluding Frame.